Gas released by a dying star races across space at more than 600,000 miles an hour, forming the delicate shape of a celestial butterfly. 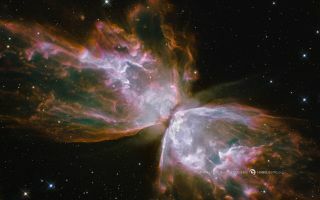 This cool space wallpaper shows gas released by a dying star racing across space at more than 600,000 miles an hour, forming the delicate shape of a celestial butterfly. This nebula is also known as NGC 6302 or the Bug Nebula.